Invite Ronny Russell to your next meeting! We've teamed up with Foodee, a company that coordinates food delivery, to make our menu available for office meetings, events, or corporate functions. We have delicious gluten-free, corn-free, soy-free, dairy-free, and vegan options built into our menu, and can help you feed everyone in your office, regardless of their food restrictions. Click the image below to browse the options and place an order. Your order must be at least $40 and placed at least 24 hours in advance. Delivery charges apply. 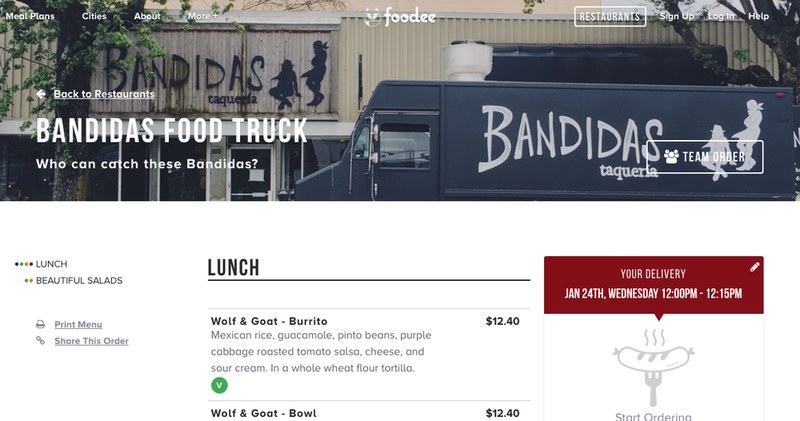 If you're interested in booking the Bandidas Food Truck for your event or party, then please click here and fill out the Food Truck Inquiry form.